Why do my crochet hands hurt? From a Frog’s Point of View, Tammy Cologie, guest blogger of The Crochet Crowd. Is it the hook I use? Is it the yarn I use? Am I crocheting for too many hours a day? I might have to stop crocheting if this pain keeps up! What are some of the reasons we have pain when crocheting? It would easy to say it is all blamed on the repeating motions we make. But the truth is, we are just too excited and into the project we are working on that we may be holding the hook too tight. We may not being taking enough breaks while working on the project and we go from one project to another without stopping to exhale let alone give our hands a break. So with this in mind, let’s look at the things we can do to prevent the pain. There are tools that are available that claim to help our hands feel more comfortable or ease the pain. Holding crochet hook and style of crochet hook matters. There is the ‘comfort grips’ or ‘gel style pencil grips’. There are even hooks made with special shaped handles that claim this too. There are also some special gloves that claim to help the hands be stress free. The cost for these items, range from a few dollars, up to seventy-five dollars. Before we buy these products maybe we should look at this a different way. Truth is we have to prepare our hands, in the same way that the athletes prepare their bodies, to begin. Our hands have muscles in them that may not be used to the twists and turns we put them through and we expect them to perform! Do not forget that everyone deserves a break. I am not saying take a break for days, I mean take a break and do something else for an hour or two. This will give your hard working muscles time to absorb more oxygen and energy and be able to hop back into hooking for you. Posture, the way we sit, makes a huge difference too! Is there pressure on your elbows as you ‘rest’ them on the arms of the chair? do you hold your shoulders up stiff-like? Putting a soft cushion or pillow under your elbows, and behind your back will help your posture and ease the pressure on the nerves in your elbows. Then there is that horrible horrible word that threatens to kill us …. EXERCISE!!! Ok, not really exercise, but at lease warm ups. We need to help our muscles help us to achieve the task without pain. Here are some suggestions that I have come up with for you to try. 1. Prayer Hands – Using the position of prayer hands with your thumbs at the middle of your chest. Hold in upright position for a few seconds, and then turn your hands downward holding the same position. So your hands are up in prayer position, then down in prayer position. This movement should be felt in your wrists while getting an excellent stretch in your fingers. Do 10-12 repetitions. 2. Shaking Hands – This is simple and fun. Simply hold out your hands in front of your body and shake them. This movement should be felt in your wrists and your hands. Shake your hands for 10-20 seconds. 3. Double Wave – Hold your hands up in front of the body at chest level as if you are about to wave hello or good-bye to someone with fingers spread, then bring your hands down bending at the wrists. Move your hands up, then down. This is similar to the prayer hands exercise, except your hands are not pressed together. This movement should be felt in your wrists while providing a nice stretch for your hands, including the fingers. 4. Shoulder Flex – In a standing position, hold a stick in both hands, shoulder length apart. Raise your arms over your head, keeping your elbows straight, and lower your arms back to the beginning position. Do 20 repetitions. 5. Shoulder Spread – While standing, clasp your hands behind your head and tuck your chin down. Lift your head and spread your elbows as far as you can to the sides. Then return to the starting position. Do 20 repetitions. There are many types of warm up and strengthening exercises that you can do. You can even ask your doctor for suggestions. Do you have hand pains? What do you do to prevent hand pain? Do you have some more tips to share with us? This entry was posted in Advice & Tips and tagged Advice, Crochet, Double Wave Hold, Frog's Point of View, LOL, Pain, Prayer Hands Using, Taking Breaks, Tammy Cologie, Tips. Bookmark the permalink. 52 Responses to Why does my hand hurt? Mary Beth – I too had pain in my thumb, I had trigger finger where my thumb would lock up and I couldn’t bend it and it would pop, it hurt like a son of a b***** and I went to an orthopedic who gave me a shot of cortisone in my thumb. It worked for 2 months and the pain is coming back again. surgery is needed to reduce the tendon it is not stretching. I wrap my thumb in Cobain at night and it pushes the swelling down and by morning I can move it again. 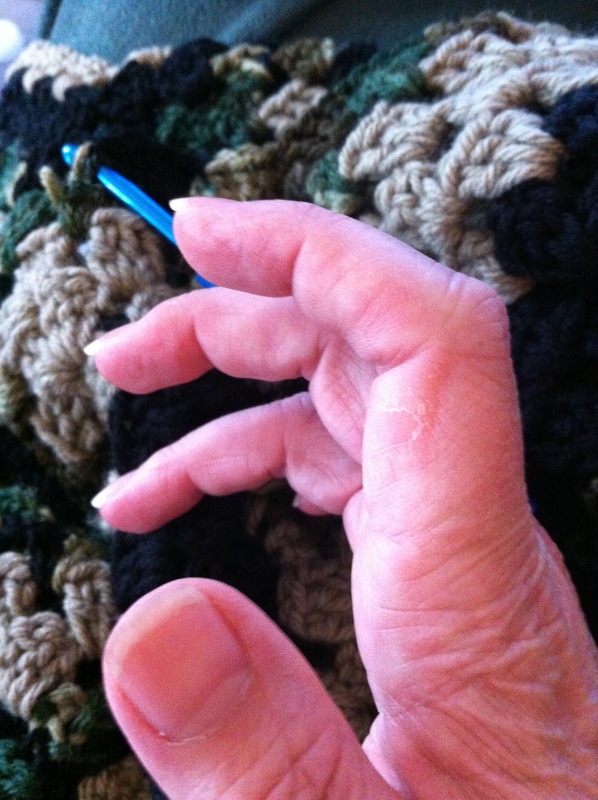 We don’t realize how many muscles we use when we crochet and my thumb (left hand) we use to hold the stitches in place etc. Thanks for the article, I’ll try some of the hand stretches. I do use pillows under my elbows and I have a power recliner that I can set to sit properly, lol… expensive gift to me but it alleviated the pain in my back and shoulder. My husband had no problem with me spending the money on it as he knows how much I love crocheting. Had surgery yesterday on my right middle and right little finger to release the trigger finger problems there. Still recouping. Thank you for the very informative article. Enjoyed reading all the comments. My hands only bother me if I go a few days without crocheting! However, my shoulder is another story~~Have had numerous surgies on my right shoulder and am looking at another. Worst thing about it~~cannot crochet for weeks after theses surgeries! so I am putting it off for awhile~~when I can no longer crochet because of the pain, I will have it done! I have carpal tunnel syndrome in both my wrists. Sometimes I wear a wrist brace, but I found that besides taking breaks, I changed my posture. I started holding my elbows closer to my body and most of the time, that works. This has been very helpful to me. Thanks, all of you. I also, get pain as I do a lot of crocheting. I was recommended by my MD to ice my wrists every few hours and that way I have to rest. I do not like to do that but it works for me. Love the Crochet Crowd! I have arthritis in both hands, I love to crochet, I think doing something with my hands. Like crocheting is great exercise for them. When my hands start to hurt, I stop crocheting for awhile. It works for me. I’m not going to let arthritis take away, something I enjoy doing. I also, have another medicial issues to. Im not giving this as medical advice, if your symptoms worsen please see your dr. I work in neurology which diagnoses CTS(Carpal Tunnel Syndrome) and tendonitis on a daily basis. Repetitive motion, the angle of your wrist, how one is sitting and the hours(yes we spend hours crocheting without a break)doing the same motion all contribute to tendonitis and/or carpal tunnel. I have been to Joann Fabric Stores and they do have a wrist brace for knitting/crocheting. If your wrist is hurting along with numbness and pain in your fingers use the brace along with taking those breaks. Talking also from experience, having CTS and then also the surgery on both wrists has changed in how long I can crochet and how I am able to hold the needle and yarn. Listen to your body and talk to your primary care physician. If pain continues, see doctor. It could be carpal tunnel syndrom. I covered my aluminum hook with sculpey dough and baked them for 20 minutes. That way I was able to shape them to the most comfortable shape for my hand. It is loads better now! Thank you Mikey great advice it`s good to know. I already have a problem whether crocheting or knitting it wouldn`t make any difference. I’ve got arthritis on both my thumbs and middle fingers they hurt more in winter I often wear gloves to sooth the pain. So I can `t crochet for too long. I noticed with knitting my left hand hurts more. Brilliant tips, thank you so much. I too have been going like the clappers since I discovered Mikey’s wonderful tutorials! One suggestion regarding cushion for resting elbows, how about using one of those breastfeeding cushions that go around your waist to rest baby on to take strain? I am going to try my daughter in law’s to see if it works 🙂 Resting elbows and work on the cushion, plus a cushion behind my back. With me, it usually the hand that holds the yarn that’s always hurt (which is my left hand), not the hand that holds the hook (right hand). Someone told me that I’m a tight crocheter and someday I will suffer carpel tunnel syndrome because of it. Is that true? My hooking hand is more prone to pain early in a project, as I seem to grip the hook tighter when I am in the learning/gaining familiarity stage. Later on, my grip loosens and my comfort/endurance goes up quite markedly! I have an ADHD level of crafting. I have 3 projects going and fuss around a lot. One crochet, one knitting and a pile of spinning. There are times I will put one down and pick up the other and still get in a sip of tea in there somewhere. I too, will fill the sink with hot water and soak for a few minutes to warm up my creaky ol’ bones. I change back and forth knitting and crocheting to rest my hands. Changing from one needle to 2 needles seems to sooth the tightness I feel after crocheting for hours without stopping. I had to have cortisone shots in my wrist because of tendinitis. I wear wrist braces at times when my wrists feel tired. Using stress balls in my hands to exercise also help with finger fatigue . I have carpal tunnel in both hands, tennis elbow, and tendonitis in both shoulders, but it doesn’t stop me from my love of crochet! Between my doctor and physical therapist, it’s mostly under control. I do have to take frequent breaks, even if it’s just for 5-10 minutes. I keep a pillow behind my lower back to help my posture. I get up and stretch and flex my fingers and hands often. Sometimes I still get cramped up and have to take a day or two off, though. Some of us hold our hooks overhanded and some hold them underhanded. If you switch back and forth, there will be less pain over a longer period of crocheting. Also, try clasping your hands together behind your back and move to the front of your body and then back again. When you clasp them, squeeze slightly to get the fingers and thumb in a different position than the crochet hook allows. One of my students bought some oven hardening clay and made an egg looking piece and then squeezed it with her hand to make her unique finger impressions. Then she took her aluminum hook and punched it through the clay and baked it according to directions. She is telling me that her hand pain has gone away since using those hooks. I just may have to try it for myself. 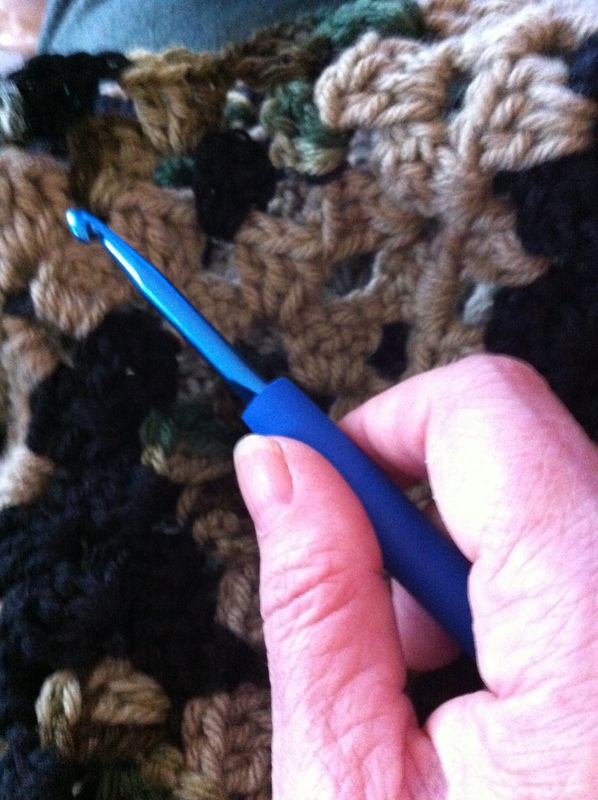 I found that I used to hold the crochet hook to tight and that would cause me pain. Now I have loosened my grip on the hook and I do not get the pain. I also did what Sandra did and realized that I had to change the way I hold the hook and how I do the stitches as there are way too many turns and twists. I have loosened my grip a lot and when I make a twist or turn I try to ease into it and make the motion smooth so that I don’t twist so much. Also many breaks for me as I don’t have as much time to crochet as some people do. Thanks for all your great tips. Mikey. I count 7 wrist movements with 1 double crochet stitch. Gonna see if I can lower that number. Don’t forget the importance of giving those hands/wrists/arms a good massage. I like to have a massage done on these every few months to strip out the knots and get my mobility back. I will also use ice to reduce inflammation and help healing go faster. My hands and wrists would hurt and I found if I didn’t crochet very fast I didn’t have that problem anymore and I could crochet longer. I have to remember to keep my crocheting arm free at the elbow (i.e. not resting it on the arm of the chair) to keep the tendons in my elbow & arm from having issues as I’m already prone to tendonitis in my dominate arm. I actually had surgery in May to help or so I hoped. I stopped hooking for about six weeks and tried Kumihimo and loved it but crochet is a an art I love. Anyhow, I am back to hooking and still swell in my lower thumb wrist area. Ice helps and rest. The surgery did not help as much as I had hoped sadly. I have noticed that how much soreness I get in my hand is directly related to which hook I am using. I have a set of aluminum hooks that I bought when I first started to crochet. When I use them I need more breaks and my hands are often sore the next day. I have also been buying hooks with an aluminum hook but a rounded wooden handle. They are slightly longer than the average 6″ hook, and I find when I use them I can go longer without a break and do not have any soreness the next day. For me, it all has to do with the hook! Great article!!! My wrists do hurt, but also the top of my hand hurts. Anyone else have that? But I will bet those exercises will help, and I am definitely going to use them!!! Thanks!!!! I have arthritis, pain in my hands is normal! HOWEVER, when I am crocheting, my hand pain decreases tremendously. Do I have to take breaks, sure! I just switch to another task for a while and go back! I’m thankful I learned at such a young age to crochet! I’m also thankful for seeing my Grandmother and her sisters, with their gnarled hands, crocheting away! They would have different projects going at one time…fine thread crochet up to the thick rug yarn. Always thought that was strange. Now I realize switching between thread and hook sizes is helpful! Thanks Mikey for this informative post!! Very helpful!!! Just as someone who is sitting at a desk all day needs to get up and stretch the legs, so we should do our arms, hands and wrist. I have a pain that runs from wrist to shoulder, so I have to stop often, do a little shake, even going to hand wash dishes with hot water! I have a sock-looking warmer that I pop into the microwave to heat my poor old joints, too. Some people prefer cold…….but I like the heat. Two tylenal and I am ready to hit the hooks again! Ive had that problem my fingers get stiff and my right shoulder and neck gets a burning pain hurts bad I have to stop crocheting for a couple of days. Other hookers told me I had to relax while crocheting I was holding n stiffing y sholders, and I relized thats exactly how I was crochetingplus it was my tension on holding my hook. Yeah I always go gung-ho on projects and end up paying for it in the end!! I recently watched your 1st video in the Curtsy series and didn’t realize that pillows under my arms would make that big a difference. However it certainly has!! Thank you, Dawn. I will pick up some yogurt and bananas at the grocery today! I had horrible leg cramps during the night last night. And, I had been drinking lots of water all afternoon when my air conditioner went out! Glad I got it fixed. soak you hands in very warm water and do some flexes with your fingers and wrists, I wait till my hands are starting to ache, then go run my water to do my few dirty dishes, but before I put the dishes in, I let my hand soak and absorb the heat, The tightness and pain does ease for me. I crochet for many hours a day. very good suggestions and tips. Mikey, I get cramps in my fingers when I’m crocheting. I have to stop, lay everything down and shake my fingers, rub them – just anything to help get the cramps out. I’m going to ask Mr. Google what I can do to stop finger (and toe) cramps. They are very painful. If any one has ideas, please share. Thanks! Lots of cramps are caused by not drinking enough water. Try keeping a large glass of water next to you and take sips as you crochet. Great idea. And I find that the plastic glasses with screw-on lids and permanent straws help me drink even more water. Somehow that straw makes all the difference and the screw-on lid keeps me from lots of would-be spills! My hand doesn’t hurt but my wrist has been bothering me. I’ve been crocheting too long without taking a break. Last night I actually watched my wrist as I did 1 double crochet stitch – honestly surprised at how many twists and turns to make that 1 stitch!!! I’ve started taking long breaks, then pick up the project and go again. Very good information! A little prevention goes a long way, and posture and grip are both very important. Crocheting should be relaxing, but it is so easy to get “all tensed up” when working on a project. Thanks for sharing these tips! great! I will have to start implementing some of these exercises. it is not my hands that hurt, but my shoulder. but i figure that a little exercise for the “hands” won’t hurt.